A professional chef plans out a five-course meal. A teacher lines up a lesson plan. A paperboy maps out a route. And a digital campaigner plans out an advocacy campaign. If you want to be successful in your advocacy work, you need to be strategic in how you go about running an advocacy campaign. That strategizing relies heavily on your ability to not only plan but also establish the best possible plan. There’s not a one-size-fits-all blueprint for every advocacy campaign. There are too many variables, between your cause, goals, advocates, and more. Not to fear! You can follow a series of steps that have the kind of flexibility you’ll need to customize your campaign plan to your specific aims. Develop Your Communications and Activities. Your organization can take this template and make it your own, personalizing it to accomplish your specific goals. In this post, we'll talk through one at a time, starting with setting a goal. Trying to plan an advocacy campaign without setting a goal is like trying to hit a piñata while wearing a blindfold. You might succeed, but you might also exert a lot of unnecessary energy along the way. With an advocacy campaign, setting a discrete goal can be intimidating. Advocacy is about enacting change, often on a grand scale. While fixing the wrongs in the world is an inspirational and motivating goal, it’s not the kind of goal you can actually create a plan to accomplish. You need specificity. From that list you can see how “fixing the wrongs in the world,” though noble, isn’t a SMART goal. Instead you’ll want something far more manageable, like stopping a bill from passing or changing a specific policy. SMART goals are incredibly important when planning grassroots advocacy campaigns. Because the main actors in grassroots advocacy campaigns are regular people instead of nonprofit or advocacy professionals, they need specific guidance, reinforcement, and measurable benchmarks to stay on track. Without breaking down your goals into attainable steps and tackling them one at a time, your grassroots supporters will get discouraged by the lack of visible progress. With dashboards at your fingertips, you can ensure that every step your team takes is a step toward completion of your goals. Once you have your SMART goal, get ready to define your message. Your message is what unifies your organization and attracts people to your campaign. To revisit the piñata example from the goal-setting section of this post, an advocacy campaign without a clearly defined message would be like attending a party with a piñata, St. Patrick’s day decorations, a birthday cake, and mistletoe hanging in the door frames. If your message isn’t clearly defined, supporters will have as good a chance of figuring out your goal as someone would ascertaining the theme of that very confusing party. Potential supporters need to know what your advocacy campaign is about. So once you've settled on a focused message, it's time to share it widely. Storing contact information of individuals who have supported previous campaigns. Highlighting connections between past and potential supporters. Integrating with your social media profiles to schedule posts. Providing current supporters with the tools to spread your message to their social circles. You should ensure that as members of your team spread your message to potential supporters, they're all on the same page. Read on to the next section to learn about putting together a team that can sustain this cohesion in messaging! Chances are, if you already have a goal and your message, you likely have some team members on board. But before you start, you need to make sure you have a team that can work well together and represent all the needs of the campaign. You'll need a team leader, authorities in advocacy campaigns, specialists in the subject matter of your campaign, communications managers, software experts or consultants, and administrative help, among others. Because a grassroots advocacy relies so heavily on empowering supporters, when launching a grassroots advocacy campaign, perhaps most important on that list is a motivational, organized leader. You might already have someone in-house that would be a great fit to lead your advocacy campaign. The advantage to hiring from within is the familiarity existing staff members have with your organization. You don't have to explain what your organization values or how you operate because they already know! There are also benefits to looking outside your organization for an advocacy campaign lead — namely, the value of an outside perspective. Sometimes, it takes an outsider to recognize areas of improvement. Excellent communication skills. Your supporters need encouragement, so you need someone who can motivate them to get out there and make a change. Specialized experience. Bringing on someone with practical experience leading an advocacy campaign will greatly decrease the amount of time you need to get oriented. Existing connections. To make sure your supporters will be heard by the right people, you need a leader who knows the best decision-makers to reach out to. A strong leader will be able to take an advocacy campaign to completion. The most successful traditional fundraising campaigns are those that are planned well in advance. A strict editorial calendar can keep these campaigns on track to meet their goals, with your fundraising team firmly in control of the timeline. Your supporters bear a much greater burden of action with a grassroots campaign. You're relying on and encouraging their passion to motivate them to action, not your fundraising team. Setting goals and strategy isn't as straightforward. While you can decide on an amount to raise for a fundraising campaign at the beginning, the political situation will affect your advocacy strategy and goals throughout the campaign. You're not asking for material donations with an advocacy campaign — you're asking for time, passion, and energy, which are sustained forms of support rather than one-time or recurring contributions. To ensure that your organization can plan for effectiveness and flexibility, you need software built specifically for advocacy. 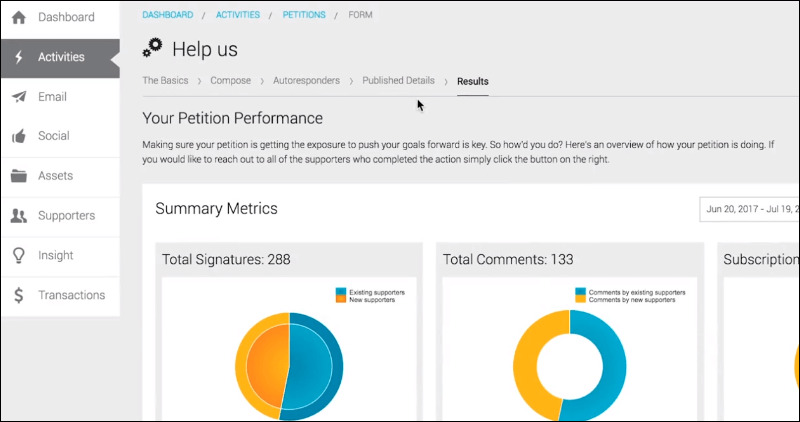 The right advocacy software will keep your campaign organized, just like traditional fundraising software, with dashboards and reporting. The difference is most obvious in the necessary communication features. There's a lot you need to share with your supporters, such as important campaign updates, online petitions, lists of legislators and their contact information, and materials for them to share with their own social networks. 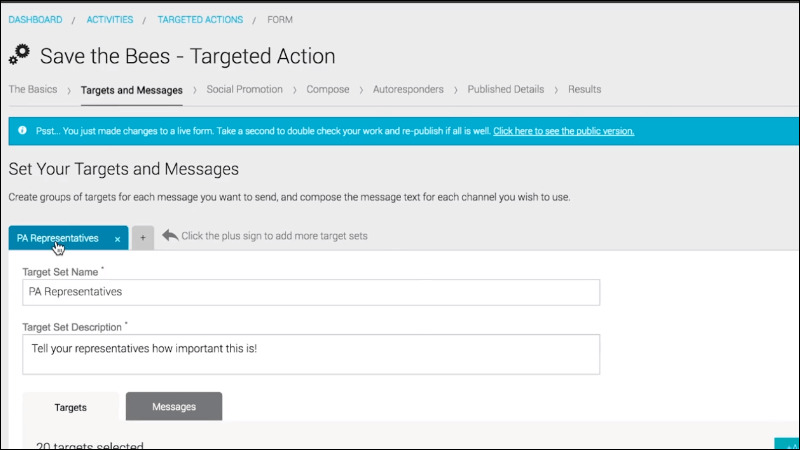 Advocacy software facilitates close connections with your supporters via newsletters, automatic alerts, social media, and more. Be sure that you choose software with communication features that can support the kind of flexibility your advocacy campaign needs to be successful! Step five is necessary to carry out the good work you’ve done in steps one through four. You need a means of channeling all of your planning into effective action. The means in question? Communications and activities. You’ll have been coming up with various actions throughout the planning process, but it is important to take the time to put metaphorical pen to paper and actually turn some of your ideas into reality, then market them effectively to your supporters. The great news is that you have plenty of opportunities to send out communications and host activities; you just need to decide what’s best given your cause, your organization, and your resources. Who/What needs to be reached in order to make this goal come true? How can my team best accomplish that? Remember that supporters and the people you’ll be working with to accomplish your goal are far more likely to help if you meet them on their terms and engage them. For example, let's say you're sending out a targeted action that asks supporters to contact their legislator. You'll want to tailor this request to each individual supporter, rather than send out a generic call to action. Using data recorded in your CRM, you can segment your supporters by their region, legislator, interests, or other key factors. 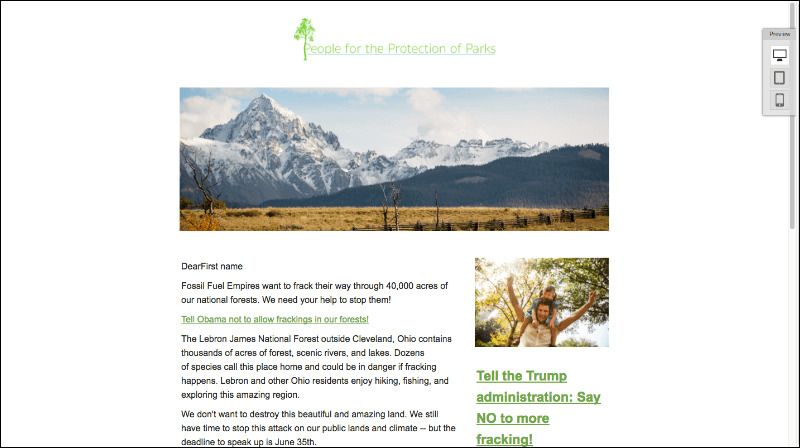 Then, you'll send customized targeted action forms (like petitions) to these specific supporters. That way, people always feel like your organization is speaking directly to them and values their support personally. When individuals are confident that your team takes their support seriously, they'll be more likely to take action for your cause today and in the future. Keep these five steps in mind as you begin your next advocacy campaign. Remember, planning should always be a part of the equation.